The British Labour Party has been in turmoil around Brexit and other policies, but nothing seems to have challenged it more than Israel, Palestine and the charges of anti-Semitism lodged against its leadership. So, at their conference last week in Liverpool, the issue of Israel-Palestine brought up an emotional reaction from the thousands of participants who were there. COLIN MONEHEN: In 1948, the Palestinian people suffered the tragedy of the Nakba, when the majority of Palestinian people were forcibly displaced from their homes. JEREMY CORBYN: And in order to help make that two-state settlement a reality, we will recognize a Palestinian state as soon as we take office. MARC STEINER: The Labour Party has zigzagged on the issue, what it considers to be anti-Semitism. 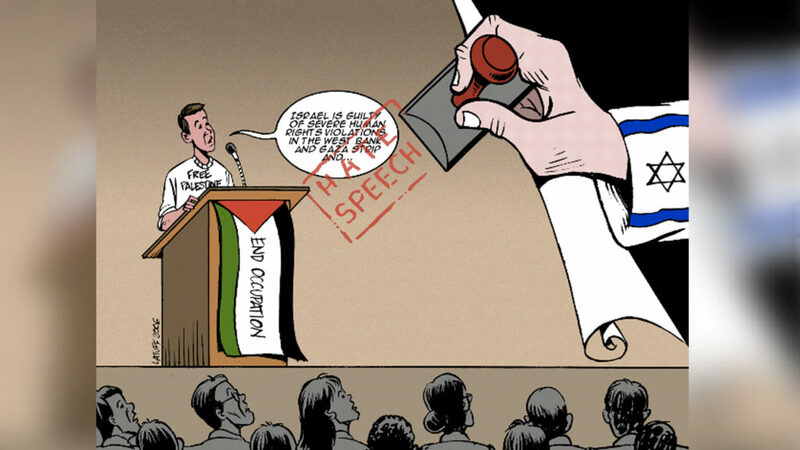 And after tremendous pressure by the Israeli lobby, it adopted the IHRA, which is the International Holocaust Remembrance Alliance’s definition of anti-Semitism, even though this definition was never intended to be used as such, certainly not as a tool to judge whether someone or some statement is anti-Semitic. At first, the Labour Party adopted the definition but not the controversial examples which were added, that effectively called any critique of Israel policy a form of anti-Semitism. It later reversed that decision and decided to include those examples, which British Palestinians and the Palestinian Solidarity Movement in that community. Without ensuring that the pro-Israeli lobby would stop its campaign to delegitimize party leader Jeremy Corbyn and others as anti-Semites. Since the definition specifically states that calling Israel a racist state is anti-Semitic, Moshé Machover, a longtime member of the Labour Party, who is Israeli born and a veteran of its armed forces, wrote an article with the title, “Why Israel is a Racist State.” The article was distributed to everyone during the Labour caucus. A huge uproar took place as many pro-Israeli advocates denounced the article. So our guest is Moshé Machover, who is a mathematician, philosopher, socialist activist, noted for his writings against Zionism. Again, he is Israeli born, served in the Israeli army, as I said earlier, moved to Britain in 1968. He was one of the founders of Matzpen, the Israeli socialist organization in 1962, and was among the first Israelis who spoke openly against the occupation of Palestine in 1967. He’s the author of numerous books and articles, and he joins us now here on The Real News. And Moshé, welcome. Good to have you with us. MOSHE MACHOVER: Good to be with you. MARC STEINER: So it’s very controversial, obviously, just calling Israeli racist, in the minds of many people, whether they are pro-Zionist, non-Zionist, anti-Zionist, have questions about the occupation. So let’s get to the heart of the matter very quickly about why you label Israel as racist. MOSHE MACHOVER: Well, you see, you should read the title of my article carefully. It is not why Israelis are racist, but why Israel is a racist state. What is the underlying reason? You see, the actual example given by the definition of anti-Semitism is that you are not allowed to say that forming any state of Israel, as if there are a few possible states Israel, is racist and devil. Now, I think that by now, the fact that Israel is a racist state is becoming so blatant in evident that it does not really require proof. I give a few indications why it is, but I think by now, especially after the promulgation of the so-called Jewish nation-state law, it is a non-controversial fact. But my article is actually not about whether it is a racist state, but why it is a racist state. Because you see, I think this is a very common discussion. Racism, schmacism, is too generalized. There are all sorts of billions of racism and the thing to really inquire into is what is the root of the specific racism of the Israeli state? Let me get an example from the United States. There are various kinds of racism that are practiced or that historically are known in the United States. There is the racism against Black people, right, African Americans, and the racism against the Native Americans. But they are not the same kind of racism, because racism comes in all fifty-seven varieties. And it is always in aid of something. It is part of the ideological superstructure that is designed to justify certain practices. In the case of the African-Americans that were brought to North America as slaves, it is a racism that is designed to justify their enslavement, their being used as workers in the service of their employers, their owners. This continues today. It is racism that justifies their underprivileged socioeconomic position. In the case of the Indigenous Native Americans, it was a completely different variant of racism. They not were represented as people who are not capable of anything except working for white people. They were represented as … in the American Declaration of Independence, they are called “merciless Indian Savages.” That is how they are described in your Declaration of Independence. It is racism that is designed to justify their ethnic cleansing. So what I’m saying is that the racism of Israel is very akin to the latter kind, the one that they just quoted. In other words, the Palestinians are Israel’s “merciless Indian Savages.” In present day parlance you call them terrorists, you see. If the people who framed the American Declaration of Independence, some of whom, not all were slave owners, but very freedom loving, if they had this term, they would have called them terrorists, “merciless Indian Savage” terrorists. So you see, that the common denominator here is that the racism of Israel is designed to justify the fact that Israel is both a product and an instrument of the Zionist project of colonization. And it is a specific kind of colonization that is like the North American one, designed not to exploit the labor of the indigenous people, but to exclude them, to replace them, to displace them, ethnically cleanse them. So this is the root of the racism. And we have to understand it, because talking about race in a kind of general way doesn’t get us anywhere if we don’t understand the function and the root of this racism. MARC STEINER: So let me ask a question. So your definition of racism in terms of Israel has to do with it’s being a colonial power over the Palestinians, over the Arab people. MOSHE MACHOVER: That is right. It is an exceptional thing, because this thing was supposed to have ended long ago. I mean, the colonization took place in the second half of the twentieth century. And in fact, all the type of colonization based on ethnic cleansing ended even before that. In this sense, the Israeli colonization, which is the Zionist project of colonization, is anachronistic. But it’s still going on. But people talk quite loosely about Israeli racism without trying to locate it and explain the function that it reveals and the reason for it. MARC STEINER: Many people; Martin Buber, Ahad Ha’am, other noted people who also were Zionists, looked at Zionism as kind of a liberation ideology, and others were really clearly colonialists. I mean, is there a contradiction in how it all began in that conflict itself inside? MOSHE MACHOVER: Well, look at the history of the United States. Some of the people who came to colonize the North American continent were themselves refugees. They came for their own liberation. But the very fact of their being colonizers inevitably put them in conflict with the Indigenous people. They were actually replacing them, displacing them, and eventually ethnically cleansing. And this is independent of the intentions, good or bad, of the people who came there. Some of them were well-intentioned people, they did not come with a preconceived racist ideology. Some did, but it a few of them realized, some did realize but not all of them, realized that the very fact, the very context of colonization will put them in inevitable conflict with the Indigenous people. Some try to find all sorts of excuses and ways to evade this logic, but the logic of history is unavoidable and inexorable. MARC STEINER: So where do you think this takes us now? Where does it take Israel now? Where does it take what the future may hold? We’ve seen the occupation take place since 1967. And the Israeli government at this moment and the new law that was just passed are truly, blatantly racist, and clearly state that this is a Jewish state “for us and not for the Arabs,” whether they be Christian, Muslim, or whoever they are. So where does this take us at this moment? MOSHE MACHOVER: I think it takes us to have to confront a terrible danger. I mean, they have ruled out, and they have in fact sabotaged and made impossible, a two-state solution. They are not going to withdraw from the territories they occupied in 1967 to enable the creation of a Palestinian state. They do not want one state in which the indigenous people may actually be the majority. So, what is the third possibility? Ethnic cleansing. I think it is inevitable that they will try to perpetrate major ethnic cleansing. The plans for this have been in the making, and they are just waiting for an opportunity. So, I am not an optimist. I think that we are facing a danger, an attempt to perpetrate major ethnic cleansing. And I think this is why world public opinion has to be prepared and made ready, and we have to do everything in order to prevent this calamity. MARC STEINER: And finally, people, as you and Daniel Blatman, who you quote in the article, the Israeli historian … so, what is what is the role now? How does, as he writes as you quote him, worrying about the rise of a fascist state in Israel … what should the response be? MOSHE MACHOVER: Well, they are almost a voice crying in the wilderness, they are the few just people in Sodom, the biblical story. There were not enough of them to save the city from the wrath of God. The people who see the danger, who cry out against fascistization are a minority. By themselves, they will not be able to prevent it. It is up to world public opinion, because the states; the United States, Britain and other Western states are not going to do anything of their own accord. It is up to world public opinion to mobilize against the impending catastrophe. MARC STEINER: And finally, now as a British citizen, a member of the Labour Party, if Corbyn was to win, become the prime minister of Great Britain, what role would that play? Would that change the dynamic at all in terms of what the future might hold? MOSHE MACHOVER: Yes, it will. And precisely for this reason, the establishment, both here and elsewhere, the so-called international community which is the United States and its followers, are doing everything possible in order to prevent it. And if and when he becomes prime minister, they will try to sabotage him. MARC STEINER: Well, Moshé Machover, we have a shortened interview today. I look forward to a much longer conversation with you. I thank you so much for joining us from London here on The Real News. It’s been a pleasure to talk with you. MOSHE MACHOVER: My pleasure. Talk to you some other time. MARC STEINER: Take care. And I’m Marc Steiner for The Real News Network. Thank you so much for joining us, we’ll be talking together soon. Take care.